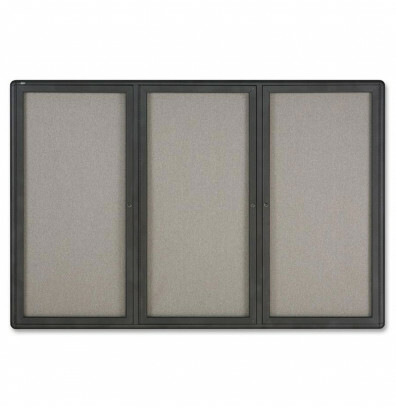 Quartet 2367L indoor 6' W x 4' H fabric bulletin board is a durable grey fabric enclosed bulletin board backed by high-density fiberboard secures documents tight. Three locking, shatterproof acrylic doors allow posting, protecting and easily updating important messages. Self-healing surface eliminates unsightly pinholes and will not fade or crumble like traditional corkboards, even after years of use. High-density backing offers maximum pin-holding power, ensuring documents stay securely posted. This durable aluminum frame bulletin board cabinet features rounded corners, full-length hinges, and a contemporary graphite finish to draw all eyes to important displays. Hanging devices are factory-installed. Easily mount board to wall with the specially designed, security lock system. Bulletin board includes hanging kit. Includes one key per lock. 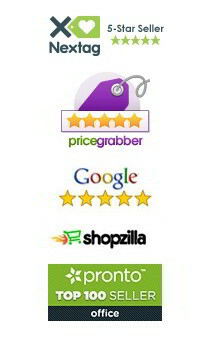 Pins and thumb tack supplies may be found under "Recommended Accessories" on the right side-bar. Durable grey fabric enclosed bulletin board backed by high-density fiberboard secures documents tight. Three locking shatterproof acrylic doors protect postings and makes updating easy. Self-healing, natural cork will not fade or crumble and high-density backing holds push pins tightly in place. Full-length hinges and contemporary graphite-finish frame draw all eyes to signage. Perfect for interior high-traffic areas, such as employee lounges. Easily mount board to wall with security lock system. Includes one key per lock.